Three Sisters, looking west between Sisters and Bend, OR. 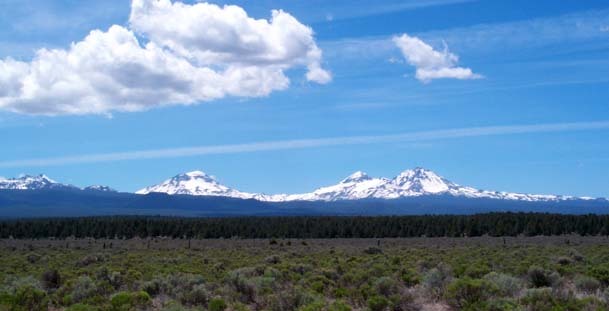 The Three Sisters are majestic rising from the high desert plain east of the Central Cascade Range. Their height is only 6,700 feet above the desert floor, compare this with the 10,200 feet above Oregon’s Willamette Valley and you can see a considerable rise is relative height. The North Sister is a shield volcano and is 10,085 feet (3,074 meters) high. North Sister is the oldest of the Three Sisters and last erupted about 100,000 years ago. It is home to the Linn, Villard, Thayer and part of the Collier Glaciers. Middle Sister is a composite volcano and is 10,047 feet (3,062 meters) high. It is home to the Collier, Renfrew, Hayden and Diller Glaciers. In the saddle between Middle and South Sister you will find the Chambers Lakes. South Sister is a composite volcano and is 10,358 feet (3,157 meters) high. South Sister is the youngest of the Three Sisters, erupted as recently as 2000 years ago. It is home to the Skinner, Eugene, Lost Creek, Prouty, Lewis and Clark Glaciers. The top of South Sister is relatively flat and is home to Teardrop Pool. You must obtain a wilderness permit to enter the protected Three Sisters Wilderness. These are usually found at the trailheads. You can also stop by a US Forest Ranger Station on your way.